the Neighborhood Queer/Trans Dance: At the Next Neighborhood: The Official Queers Who Look Like Justin Bieber look-a-like contest! 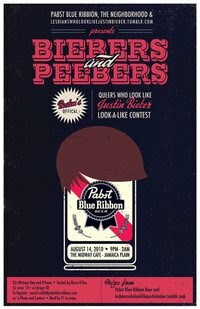 At the Next Neighborhood: The Official Queers Who Look Like Justin Bieber look-a-like contest! Biebers+Peebers : The Official Queers Who Look Like Justin Bieber look-a-like contest! Do you have that look? You know - the one that gets you carded because you pass for a teenage boy? Show it off and win prizes at the official "Justin Bieber Look-a-Like" contest! Hosted by the fabulous Becca D'Bus with DJs D'hana and guest Whitney Day (NYC) - who will rock your body all night long. To Register - email reilly@pabstblueribbon.com w/ a photo and contact. Must be 21 to enter.